1. Please arrive early for the performance. 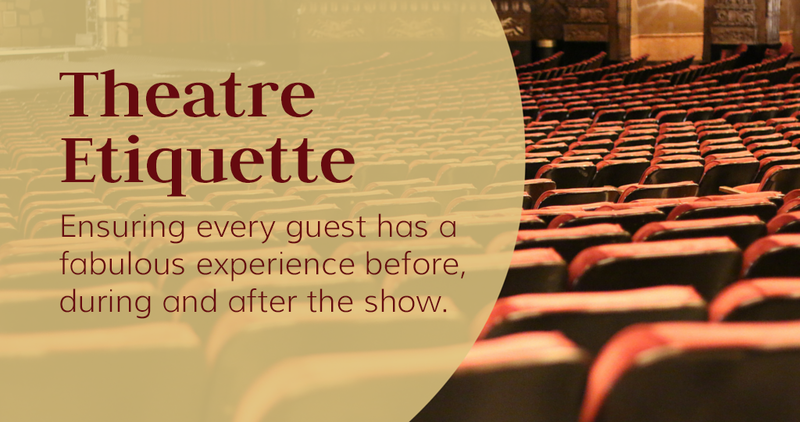 Guests who arrive late may be held outside the theatre until they can be seated without disturbing other guests. We recommend that you arrive approximately 30 minutes before show time to be seated before the performance starts. 2. Please do not leave your seat during the performance. If you need assistance during the show, please see the nearest usher. If additional assistance is needed, the usher will find the appropriate person. 3. Please sit in your assigned seat throughout the show. 4. Please silence or turn off all cell phones and electronic devices. We also ask all guests to refrain from texting or using a phone to check the time during performances. The light is distracting to the performers and other audience members. We encourage you to share your experiences with us on social media, but please wait until after the show or during intermission. 5. The use of recording devices and flash photography is strictly prohibited. Please see the individual show page for more information on the photography policy or call 314-534-1111 for additional details. 6. The sound system for each show is provided by the touring production. Unfortunately, many variables may impede the sound quality. Please see an usher if you are having difficulties hearing the production. 7. Please refrain from talking, humming or singing during the show out of consideration for other patrons. 8. Outside food and beverage is not allowed in the Fabulous Fox Theatre.